You're welcome and a HUGE Thanks as well!! Is that API going to stay up? And are you adding more recipes to it? I just want to say Thank You again!!! Yep API is stable now, and I will add more recipes soon. Its quite a long process as I like to find nice meal images and detailed instructions. I'm still waiting for someone to write a Kodi Add-on so it will really motivate me to add more content. I see they are written in python... interesting... I'll have to take a look at a couple of addons to see how they work... OH by the way I'll be adding credit to the module to show where the info is coming from!! @docwra, is there a way for other people to add recipes? I have a whole lot I would contribute. (2017-02-17, 05:37)nickr Wrote: @docwra, is there a way for other people to add recipes? I have a whole lot I would contribute. The feature is already available yes but without a huge list of common ingredients it is quite hard to do at the moment. 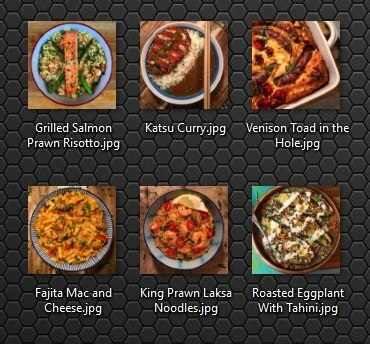 You can give it a try now, all I ask is there is a good high quality(700x700) image of any meal you add. Recipes without images are pretty useless in my opinion. Try to keep the ingredients as generic as possible like Broccoli rather than "chopped" broccoli. What I will do in the future is add more ingredients and create pull downs instead of text boxes to keep the database consistency. EDIT: Added 10 new recipes today so that's a lot more new ingredients as well. Cool. I will add some. Haha, yes my spelling isn't the best. I've added French Lentils as an ingredient, just let me know if you find any others missing. Thanks guys!! It's a really cool thing this API... I have to update the module as I'd like to put a tag on the bottom showing where the recipe came from. Soon! @zag need api Key for TheMealDB.com! please PM me. @nauman API key sent, let us know what you come up with! You can find it in the screensaver section, although it does far more than just that. I will get the Add Meal feature up and running in the next few days so people can add their favorite meals to the database with a nice picture. I would like to use this mealdb for an app i'm creating for school. I would really appreciate it if you would send me an api-key. No need for an API key for that, just use the developers key of "1"